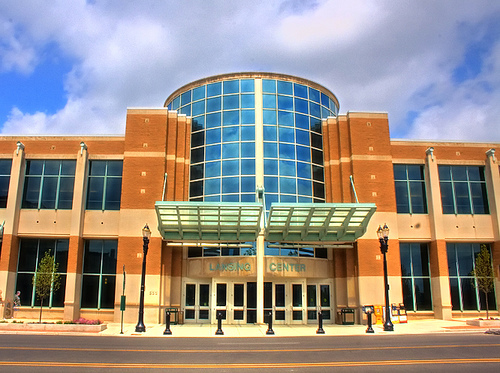 Parking lots under and north of Lansing Center are available at $6.00 per entry, per day. The facility is open 24 -hours. Fees are charged 6am – 11pm (Monday – Sunday) and on event days. Credit card payments are available at all exits. Cash payments are accepted if a parking attendant is present. Pay-on-foot machines are also available in the lobby of Lansing Center and the parking level of the building. The pay-on-foot machines may be used to pay for parking in the lots located north and under Lansing Center. Pay-on-foot machines will accept cash, coupons or credit card payments. Hours: 24 hours Rate: $6 Flat Fee Cash & Credit Cards: Accepted at entrance or exit. From Westbound I-496: I-496 west to Exit 7A to Grand Avenue. Turn right onto Grand Avenue (north). Follow Grand Ave to Shiawassee. Turn right on Shiawassee and go across the river to Cedar St. To park under the Lansing Center, turn right on Cedar, then right onto City Market Drive, which eventually changes into Museum Drive. Follow signs for Lansing Center parking and enter the building through the glass parking area lobby. Eastbound I-496: I-496 east to exit 6 (Pine / Walnut St.). Merge onto the service drive and take about ½ mile to Grand Avenue. Turn left (north) onto Grand Avenue. Follow Grand Ave. to Shiawassee. Turn right on Shiawassee and go across the river to Cedar St. To park under the Lansing Center, turn right on Cedar, then right onto City Market Drive (just past the colorful Marketplace Apartments), which eventually changes into Museum Drive. Follow signs for Lansing Center parking, and enter the building through the glass parking area lobby. From the Detroit Area: Follow I-96 West to the 496 Downtown Exit. Continue on 496 to exit 7A to Grand Avenue. Turn right onto Grand Avenue (north). Follow Grand Ave. to Shiawassee. Turn right on Shiawassee and go across the river to Cedar St. To park under the Lansing Center, turn right on Cedar, then right onto City Market Drive (just past the colorful Marketplace Apartments), which eventually changes into Museum Drive (just after the Lansing City Market). Follow signs for Lansing Center parking, and enter the building through the glass parking area lobby. From the Grand Rapids Area: Follow I-96 to 496 East Downtown Exit and continue on 496 to exit 6 (Pine / Walnut St.). Merge onto the service drive and take about ½ mile to Grand Avenue. Turn left (north) onto Grand Avenue. Follow Grand Ave. to Shiawassee. Turn right on Shiawassee and go across the river to Cedar St. To park under the Lansing Center, turn right on Cedar, then right onto City Market Drive (just past the colorful Marketplace Apartments), which changes into Museum Drive. 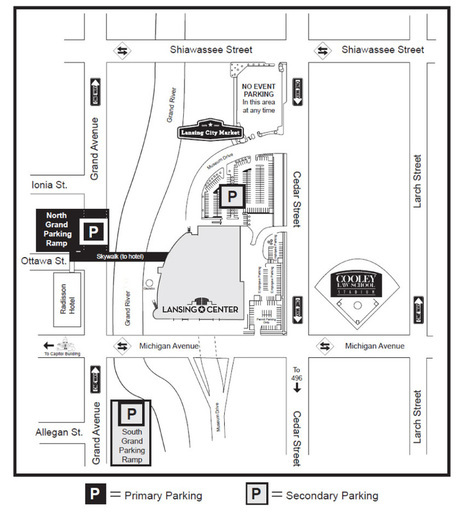 Follow signs for Lansing Center parking, and enter the building through the glass parking area lobby. From the Flint Area: Follow 69 West to 127 South to the 496 West Downtown exit and continue on 496 to exit 7A to Grand Avenue. Turn right onto Grand Avenue (north). Follow Grand Avenue to Shiawassee. Turn right on Shiawassee and go across the river to Cedar St. To park under the Lansing Center, turn right on Cedar, then right onto City Market Drive (just past the colorful Marketplace Apartments), which eventually changes into Museum Drive. Follow signs for Lansing Center parking, and enter the building through the glass parking area lobby. From the Jackson Area: Follow 127 North to the 496 Downtown Exit. Continue on 496 to exit 7A to Grand Avenue. Turn right onto Grand Avenue (north). Follow Grand Avenue to Shiawassee. Turn right on Shiawassee and go across the river to Cedar St. To park under the Lansing Center, turn right on Cedar, then right onto City Market Drive (just past the colorful Marketplace Apartments), which eventually changes into Museum Drive. Follow signs for Lansing Center parking, and enter the building through the glass parking area lobby. From the Battle Creek Area: Follow 69 North to 496 East Downtown Exit and continue on 496 to the Cedar/Larch & Pennsylvania exits. Follow the Cedar/Larch signs and exit right onto Larch Street going (North). Follow Larch to Shiawassee. Turn left on Shiawassee (go one Block) to Cedar. Turn left on Cedar, then turn then right onto City Market Drive (just past the colorful Marketplace Apartments), which eventually changes into Museum Drive. Follow signs for Lansing Center parking beneath the building, and enter the building through the glass parking area lobby. For current downtown road closing and construction information, please visit www.lansingcso.com.